Clear Communication: Noticing: What /r/ you looking at? Noticing: What /r/ you looking at? Noticing that there are differences is harder than it looks. I've come around to thinking that listening for sound itself- something besides the meaning- is the key in the learner's development of confidence in their speech. There is a "top down" approach to teaching sounds and it just seems like painting a car on canvas and trying to drive it to work. This when a teacher or a learner has determined that a native accent is a composite of a series of sounds. These might be those famous 44 sounds of Received Pronunciation or the variants and varieties that have been analyzed well enough to be lumped together and given symbols from the International Phonetic Alphabet. But how does an accent or dialect group coalesce? I think it's just by listening and respecting the other person as a good place to be aurally. The differences in sounds are the results of the physical posture, of your voice organs and breath. Your vocal settings. Old B. Honnikman suggested that back in 1964 and most people who have looked into it, like you, might have had the same inkling. This link will fill in the back story a bit. But how do we come to set those settings? What do we use to measure? We learned our accents as kids. We didn't have measurements then. When we are this far from understanding and so involved in wanting to be bigger and develop we need and use something- we have comparison, only comparison. "This sounds like that, more than that other one." A great experiment in class is to ask your students to talk like an American trying to speak their language. You'll be surprised how good and recognizable they are. And it's funny. And fun. But it's key for building a mutual understanding: they hear some features of the "native" voice. But what else can you draw from the experience? They recognize it as too far out. Features are too far out. It's laughably nasal. But listen for their "trouble sounds": what happens to them? If they stay maybe they really haven't noticed the differences. Maybe they are oblivious to the sound. Maybe they haven't noticed them. Let's look at comparison. How can we aid the learner in comparing his /r/ sound and a native /r/ sound or a target /r/ sound. I have a Korean student who struggles with the /l/ and /r/ difference. I have another one who hasn't noticed the difference. Compare the two learners. Let's say the Struggler and the Oblivious are in the same level. They get a teacher who feels that pronunciation work is useless. The Oblivious one goes on until she finds a teacher who helps her notice, or a moment where she has an epiphany. The Struggler with the same teacher gets frustrated with teachers and starts investigating on her own but finds less value in the teacher/learner experience. I think this is where a lot of students find themselves. I think a Learner (yes, a big-L) will look for these differences but won't know they are there unless they get the epiphany moments or abandon their old voice. This won't happen if they've been studying for years. It'll take a book to convince them that it's possible to change, that there is a way and that it's worth changing. I'd much rather have the Struggler in class but most of the time I have the Oblivious. With the Struggler two thirds of the work is done. "Though learners may be able to recognize individual sounds, or phonemes, belonging to language, they have much more trouble assessing their problems (Dlaska & Krekeler, 2008) and prescribing ready solutions. " 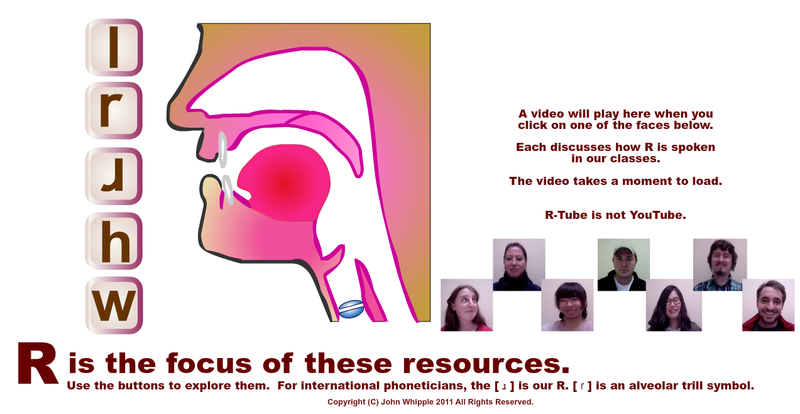 But we can work with both of them if we have an understanding of how the mouth works and can work to make the different sounds. Here's my little help. All rights reserved i.e. if this shows up in OUP or CUP I will come after you. Love to my brave volunteers. Especially Shane and Saemi whose accent is not that bad. Respect to John Levis and the team at U.Iowa.